Today was the last day of my 'urut' session. Although it felt like a luxury having someone coming to your home to do massage and other traditional treatment on your body for two and a half hours every morning, I am secretly glad that it's over! For one thing, I won't have to chit-chat with the 'makcik urut' anymore. (I really think there is nothing worse than a chit-chatting masseuse, when all you want to do is relax and be pampered!) Also, I won't have to worry about my hungry baby at the 2 hour mark every morning. Then there is the 'tungku' process which is basically a hot stone treatment. Again, this is to apply heat in order to burn all the fat which has been accumulated in the last 9 months. This actually feels really nice, made especially exotic with the aroma of 'daun mengkudu' that wraps the stone. Although I find all these 'pantang' tradition very interesting, I won't be able to judge if it works - since I did not follow it religiously. I shower and take-off the 'barut' after a maximum period of 4 hours, I do not 'pantang' with my food and i go down the stairs and sit outside sometimes for fresh air. Erm... in fact I have actually been out to the shops! Now, I guess I will just have to find other means to lose all these extra weight.. 5 kg to lose - wish me luck! After keeping a long silence from my blog (reason: pure laziness), I thought this might be the perfect time for me to start writing again.. although I'm not sure how serious I'll be this time, especially when baby Imran starts to keep me busy. At the moment, he pretty much sleeps for about 22 hours a day. And this combined with me having to stay at home for a supposedly 42 days since his birth (which already I'm feeling is impossible), led me to decide to start blogging again. So here I am, proudly announcing the birth of our first child. The pregnancy was quite easy and the delivery too was very smooth, so let's just hope parenthood would not be too harsh on us! 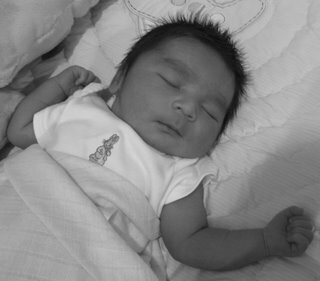 Baby Imran is 2 weeks old tomorrow and I can already see he's filling up (with fat of course). He hates bathing and changing, loves to scratch his face with his long nails, hates to wear mittens or worse still being swaddled, looks very much like his papa, feeds well, and in our eyes - the cutest baby on the planet! Dino and I would like to thank those who sent their well wishes and gifts. It means a lot to the both of us.